If you’re the type of person who’s inclined to believe that ghosts are real, then it only stands to reason that some of those spirits wandering the Earth must have been famous in their physical incarnations. Who’s to say we aren’t being haunted by our favorite dead rock stars? Obviously, Ultimate Classic Rock can neither confirm nor deny that deceased musicians are reaching out to the living from beyond the grave, but in the spirit of Halloween, we’ve decided to look around for some of the more interesting claims from people who believe they’ve been contacted by dearly departed rockers — starting with a story from former Doors keyboardist Ray Manzarek, who once shared the tale of how he and ex-bandmate Robby Krieger may have been haunted by deceased Doors frontman Jim Morrison. 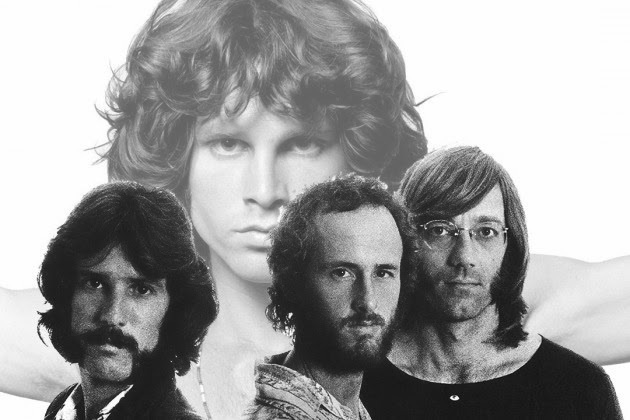 Morrison fans may recall that Manzarek and Krieger are far from the only ones who’ve wondered whether the Lizard King lingers; in fact, in 2009, researchers made headlines when they claimed that a photo purporting to show Morrison’s spirit lingering over his grave had been analyzed and proven not to be faked. Perhaps the singer’s 1971 death was not ‘The End’? Of course, Doors fans don’t get all the supernatural fun. When the surviving Beatles reconvened to touch up some of John Lennon‘s old demos and use them as new tracks for their 1995 ‘Anthology’ CD/documentary series, Lennon’s old bandmates George Harrison, Paul McCartney and Ringo Starr wondered whether Lennon might have been haunting the sessions … in the form of a white peacock. Elvis Presley has apparently been quite busy since making his way to the great beyond, at least if you accept the multiple reports from true believers who claim to have seen him lingering the hallways at Graceland and the former RCA Studios (as well as the streets of Nashville, apparently). Is it the King, or a secretly alive Andy Kaufman? The world may never know. We’d be remiss if we failed to mention Cass Elliot, the Mamas and the Papas singer who movie star/vodka distiller/real-life ghostbuster Dan Aykroyd has long accused of haunting his Hollywood home. It’d be only fair if this turned out to be true, given that Elliot lived there first — and according to the person who bought it, ‘National Lampoon’s Vacation’ star Beverly D’Angelo, Aykroyd might really be onto something. Residents of Clear Lake, Iowa, earned their (dark) chapter in the rock ‘n’ roll history books when a plane carrying Buddy Holly, Ritchie Valens and J.P. Richardson, a.k.a. the Big Bopper, crashed there on Feb. 3, 1959, killing everyone on board in an incident widely referred to as ‘the day the music died.’ Those who live there today occasionally report seeing a “phantom plane in the area,” and “ghostly lights” are also known to flare up. Meanwhile, some claim to have seen the faces of the Lynyrd Skynyrd members who died in an October 1977 plane crash, looking over their graves. Finally, there’s the case of New Haven, Ct., which is said to serve as a veritable hub for the afterlife — including the ghost of Jimi Hendrix, who some believe occasionally wafts in to play guitar at Yale’s Woolsey Hall. How long before the Hendrix estate releases one of these performances as an officially licensed bootleg? Only time will tell. So when you’re handing out candy this Halloween, think of your favorite rockers who have departed this mortal coil, because you never know when one of them might be trying to reach out for a paranormal meet-and-greet. After all, if Vince Neil and Bret Michaels can see ghosts, it can happen to anyone.